Telephone: Call 603-894-4653 Ext. 10 or 11 to Order by Telephone (with a valid credit card). Visit: Visit Us in Person at the Proshop. Note: For Online and Telephone Orders, please allow time for processing and delivery (via U. S. Postal Service). Orders placed Mon-Fri will usually be mailed within 24 hours. Saturday, Sunday & Holiday orders may require extra time. 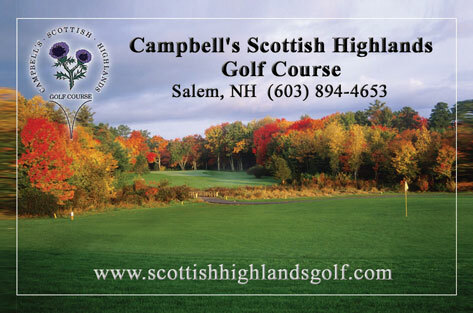 The cards feature a beautiful “New England Fall Scene of Hole # 6 at Scottish Highlands.” They are a great gift idea for the Holidays, Father’s Day, Mother’s Day, Birthdays or for any other special occasion for the golfers in your life! Gift cards can be purchased by cash or charge (no checks) for any dollar amount starting at a minimum of $20. 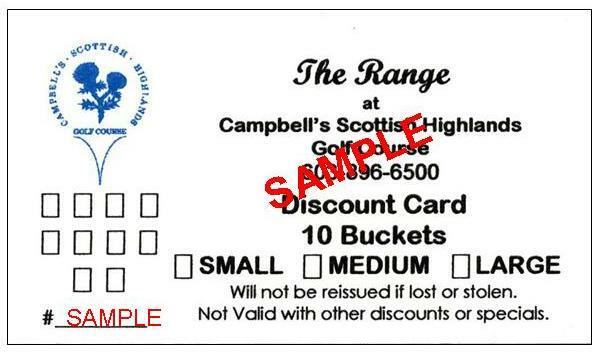 Range Discount cards provide approximately 20% off of regular rates. The Range Discount Card makes a great gift for anyone golfer who would like to sharpen their skills at The Range at Scottish Highlands. It’s also great package for kids or for beginner golfers who would like to “hit a few” throughout the summer season!